Visit the Need for Madness homepage here! The single-player version is available for free download hare! 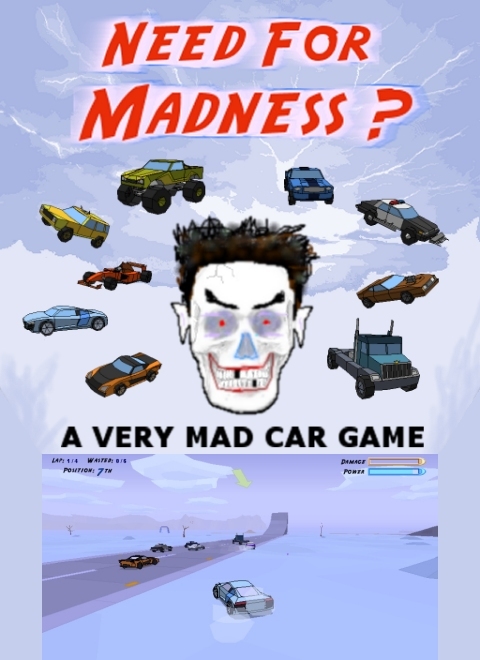 While the multi-player version can be tried by playing the game online at: Need for Madness Multiplayer - The mad car racing game! The game is going to be released on Desura August 19th 10 PM! Get ready for a really wild and crazy ride in Need for Madness! The videos and screen shots of the game do not serve it correctly or really show what it is about! You need to try playing it to see. What is truly special about Need for Madness is it's gameplay! Download it and give it a try, it's only 19MB and free! it just pauses automaticaly every time during a race. **** a Duck! COULD be fun IF it had 2-player split-screen, more bot racers (10--12) and a championship mode. i dont know... i hit install game in desura, it downloaded, then launching game it has error message "could not read common/launch.sh"
started playing this in like 2006 on miniclip and never stopped! best casual arcade game ever! This game is really good! The physics and tight mechanics are what really make it fun! This game is flippingly insane. But then again I guess that's the point. Love the physics. Video is like "Im on drugs but that's ok"
Omg, love this game. Used to play it back in 2007.